We had a little trivia moment in our office, where we all guessed the animal with the strongest bite force (hey, some days we get distracted). Marvin in Accounting guessed the Great White Shark. Nope! Cecilia in Marketing guessed an orca. Close, but also no. Lou in Shipping guessed a rattlesnake. Wrong again. Grizzly bear? Nope. Nope. Nope. In fact, the animal with the strongest bite in nature is the crocodile. Have you ever seen them chomp down and go into a death roll? Yeah...uh...we wouldn't want to experience that in nature. Of course, none of that—the math and statistics of bite force—means anything to your little croc-lover. They just think these prehistoric beasts are the best! And hey, that's good enough for you, right? 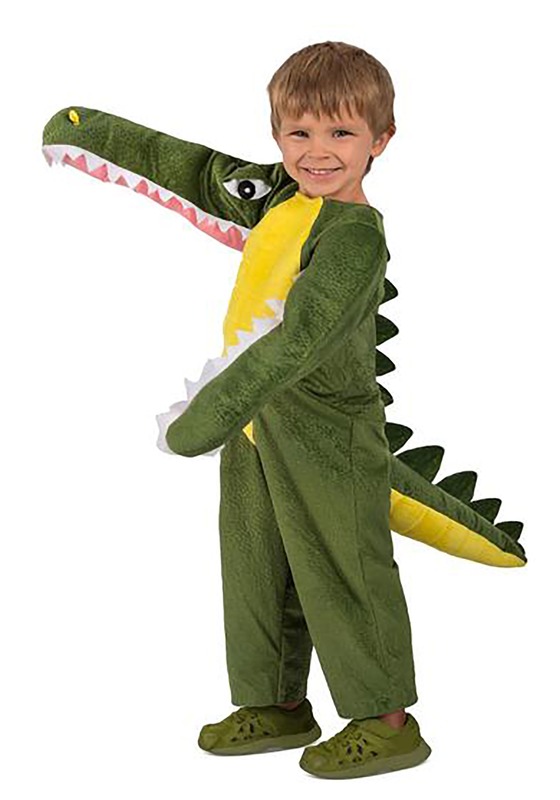 Help them bite off more fun than they can chew this Halloween with this Chomping Crocodile Child's Costume. Finally, your little reptile can run around the schoolyard, "biting" all their friends, and not get into trouble for it! This is a sweet and snuggly (probably the only time you'll ever hear that word associated with a croc!) costume, comprising0 a soft green jumpsuit with a cool croc-skin print and a fun stuffed tail. Yellow accents adorn the belly and tail, but the real fun comes from the crocodile's mouth, which is actually made up of the arms of this costume! Sharp white teeth protrude from both sides, so your child can roam around the neighborhood ready to gobble up all the candy they can find. While we'd never want to be surprised by a real crocodile coming up from behind us, we must admit, the effect of your kiddo jumping out and "chomping" their arms together is quite charming. Enjoy watching your child go full-reptilian this Halloween. And remember, crocs are carnivores, so don't even try to get them to eat a vegetable tonight. Croc's orders!